Right view or right attitude is very important in awareness-wisdom meditation. Otherwise you become depressed when you watch your mind because you identify with the defilements. That’s why I said that you must have right view first. Whatever is happening doesn’t belong to you. The mind is mind, defilements are defilements; they don’t belong to you. For example, anger can happen to anybody, nobody can say: Anger belongs to me. Anger is anger, anger is nature. Knowing your mind is not good news – there are a lot of defilements. Craving, aversion, jealousy, anxiety, and worry – all defilement is inside there, even your darkest fears. First, we must know that the mind is nature. Wholesome mind is nature; unwholesome mind is also nature. Then the mind can accept whatever is happening, and then the mind can watch. Otherwise, the mind will resist (‘Oh, my mind is so dirty’). Every time you’re aware, you must have right view. Make this a habit: every time you’re mindful, you must check if you have right view. The mind doesn’t go to the sound. It is the paying-attention-mind happening. This is the right concept – the mind pays attention at one instance. The next mind is a new mind. Otherwise, you think that the mind goes there and then comes back; that there is only one mind. Your realization is right if you understand that this mind is happening and then is finished, the next mind arises and then is finished. One mind does its job and then it’s finished; the next mind arises, does its job and then it’s finished. If the mind feels strange being aware initially, not natural, it is not because something is wrong. Previously we have wrong view – we observe with the idea of ‘me’. Now that awareness is working with some wisdom, the view is starting to change; that is why you feel strange. Before, it’s ‘me’; now it’s ‘no me’. The view is changing; that is why you feel strange. Sayadaw: Right view is to know that whatever we’re observing is nature and you could also describe it as something universal, that whatever we’re observing is universal like seeing or the ability to see. Seeing function is the same for everybody; likewise for sensations such as heat – everybody experiences heat, heat is just heat. That what we’re observing because it’s a universal quality therefore it is not personal. Yogi: But I don’t understand what it has to do with right view. I understand that it’s not personal. Sayadaw: That is the right view! When we can think of something as not yours, but that it is something universal and it has unique characteristics, and is a process that has its own causes and effects, then that’s right view when you can observe something through that lens. You’re then watching with right view. Right view and wrong view are opposite of each other. Wrong view is personalizing experience. For example, you’re observing this process of mind and body and thoughts come into the mind; don’t you think these are your thoughts? That’s what we usually think, right? ‘I’m thinking this.’ We’re observing it and at the same time, we do feel like ‘I’m thinking’ and these thoughts are mine. That’s the wrong view. Right view is not personalizing experience. First have the right view that this aversion and the craving for the pain to go away are nature. Having adjusted to right view, you then watch the aversion and craving. You are not trying to make the pain or aversion go away. Why do we wait and watch? If we watch long enough with right view, we might understand more about them. When we first apply right view, it doesn’t have much power because we are trying to apply second hand knowledge. It’s fine that we just try our best and then slowly we’ll get glimpses into its nature, then true right view is fed into your understanding. At that time you’ll truly see what is happening as it is. The primary skill, the true skill in meditation is learning to watch objectively without any reaction towards what is being observed. When we have any negative experience be it pain, sound or emotion, the mind’s instant reaction is resistance towards this experience. Our habit is whenever we have aversion we instantly have aversion to the aversion and so on. We don’t see it as nature because right view is lacking. We don’t have the skill yet to have right view, so we make the effort to bring in right view intellectually. We need lots of practice. Yogi: What to observe when all bodily sensations seem to disappear although awareness is there? 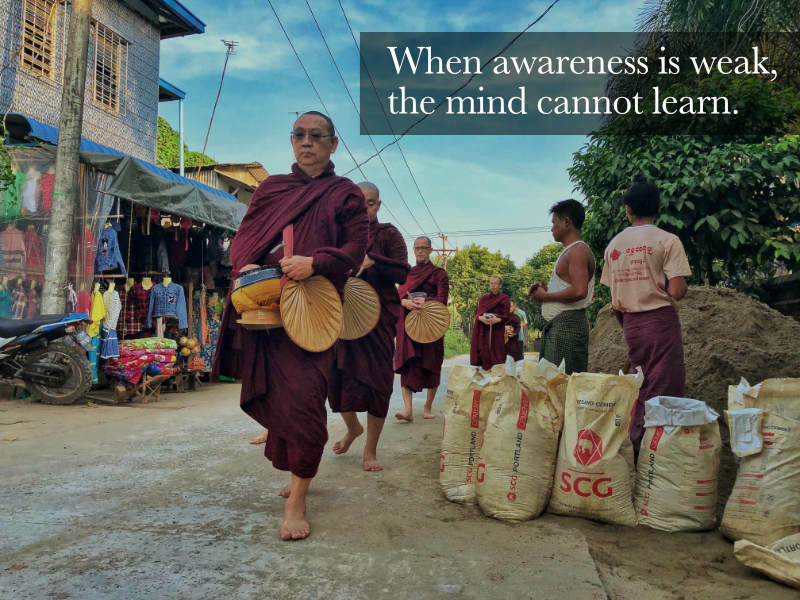 Sayadaw: Then, watch the awareness. If you are aware of awareness and it becomes stronger and stronger, then these subtle objects can become obvious. ‘Disappear’ means you don’t see the subtle level, that’s why the mind judges that there’s nothing, but actually physical process is happening all the time. The mind can’t know the subtle level yet; that’s why the mind says there is nothing. But this nothing is also an object and awareness can be aware of that. Yogi: When observing the breath, I notice that it’s not comfortable. Also I notice sounds. Should I adjust the breathing? Sayadaw: No need to do anything, whatever happens let it happen (just observe). Yogi: In walking meditation, the mind pays more attention to outside things such as the air blowing and the body feeling cold. Also when people pass by, I see and hear them; then the mind wants to look closer. 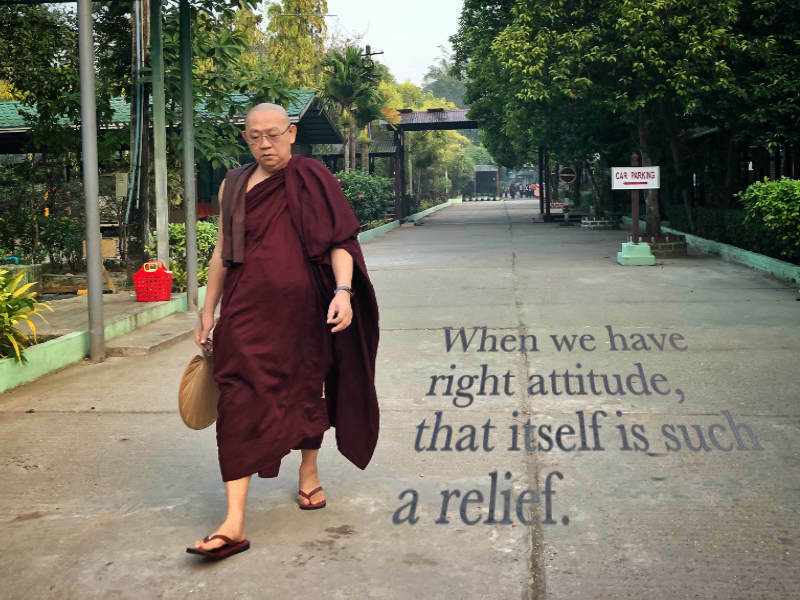 Sayadaw: Pay attention to the bodily sensation, not to the thing outside – cold air. When you see and hear people passing by, you know the sound object. If you see the people moving, they are not the object, but sight or what is seen is the object. When the mind wants to look, you should be aware of this wanting to look. Whatever the mind is doing, you know what the mind is doing. Also try to know the mind-body process in your actions. If it is something wrong, then you’ll know that it is wrong. That’s important. If you know whatever is happening, then it is okay. Knowing is not nothing; knowing is collecting information. If the information is complete then wisdom can come by itself. So whatever happens, try to know – what is happening in the mind, what is the body doing; whatever, just knowing, knowing, knowing. After it is over, if you know it’s wrong, no problem. That is also an understanding – should or should not is also an understanding. A yogi queues up in the dining hall. There are 2 types of fruits: banana and pineapple. He doesn’t like pineapples; he looks at the bananas and straight away the mind has already chosen the best banana. Suddenly shame arises in the mind. The yogi sees the whole process. Naturally lobha does its job and it is over. Awareness is also there – it sees the whole process unfolding. Thereafter, there is realization that it shouldn’t be so. Because of understanding, moral shame and moral dread arise. Vipassana is to see the process naturally; we don’t interfere in the process. Awareness does its job; the process also does its job. Then understanding arises. That is vipassana nature. Samatha is concentrating and suppressing, not allowing the defilement to arise. Therefore the mind is peaceful. This is the samatha idea. For Vipassana, we must separate the experience and the awareness. Awareness must be ready all the time in the mind. When defilement appears – body and mind already respond; he looks, he likes and he takes. Craving nature is working – the process happens and is finished. This is happening naturally and openly. But awareness also sees the whole process; then realization arises. This is Vipassana nature. We don’t need to stop the experience or interfere with the process. But for beginners, this is difficult if awareness is not good enough. If you let the defilement happen with weak awareness, then the defilement overwhelms the whole mind. If you try to focus, then defilement cannot move. It is like this in the beginning. If awareness becomes more skillful – it knows how to back up and watch, and has momentum – when something happens, it sees the whole process and then realization arises. Don’t forget a yogi’s job. Whatever happens, you must have the right view – right view means whatever happens, you must think as nature. Every time you see the mind process and physical process, it is easy to understand anatta. They come and go all the time, you cannot hold them, cannot stop them. They are happening their way. Everything is experience or object, there is nobody there; it is impersonal. Because we think it is “I” and we take what is impersonal as personal, then defilement can arise – liking and disliking, fear, anxiety, worry – because of concepts or wrong views. So, you must have the right view – this is the understanding. Every intelligent person when they see the mind process, they can easily understand anatta. There is nobody there, just cause and effect process. Seeing process is nature, seeing is happening. Hearing is happening. Seeing process, hearing process; these are processes. They are happening the way they happen by the cause and effect. Cause and effect process is just nature. Without sound, you cannot hear. Because there is a mind, we can know the sound. This is a conditioning. Seeing consciousness, hearing consciousness is happening because of conditioning. There must be object, light, attention and also the eye must be good, then these 4 causes happening, because of these 4 causes then 1 eye consciousness can happen. This is conditioning. Seeing process is happening; hearing process is happening. If any one of these 4 causes is not happening, then seeing consciousness or hearing consciousness cannot happen. It is cause and effect process. When we hear and see, we think that hearing is me and seeing is me. We believe it is me. This is wrong view. Actually it is conditioning – just that seeing process is happening and hearing process is happening. You should think that it’s nature; so, you must have right view. Yogi: In the Mahasi practice with rising & falling object, we have to see the object very clearly to have the penetrating mind to see the Three Characteristics. Without seeing the object clearly, how can we develop the penetrating mind? Sayadaw: We are not trying to see the Three Characteristics; we are trying to understand the Three Characteristics. You may have the experience but not the understanding. Rising and falling is the characteristic, sign of Anicca, not the understanding of Anicca. People when they see the Three Characteristics, they think that they know Anicca, but, not yet. Experience and understanding are different. Many people have the experience but not the understanding. Because they want to see, because craving wants to see, then they focus too much and they see, but they don’t understand. We are not trying to see, we are trying to cultivate the awareness moment to moment. It is not for nothing. This will make the mind stronger and stronger. Then the mind can understand, can see this subtle level; this is not your choice, but wisdom’s choice. If your wisdom grows, the mind is more powerful, the mind can see this subtle level. That’s why we try to cultivate this quality. It means that we try to cultivate awareness, Samadhi and wisdom. When they increase, defilements decrease. Defilements must decrease; if defilements cannot decrease then understanding cannot come, no matter how much concentration the mind has. Because when awareness, Samadhi and wisdom increase, then only defilements can become weaker and weaker. You already see this rising & passing away, but how much do you understand about Anicca? Each rising and falling may be different but Paramatha/reality is the same, right? Whatever the rising and falling, the understanding of Anicca is the same. Paramatha has no shape, no form, and no color; just changing and understanding impermanence. Because of understanding impermanence, the mind must be detached. Because of understanding, craving must decrease; the mind must have more freedom, more liberation, and be more detached. You’re not attached to anything. If real understanding arises, attachment must reduce. So, don’t try to see the rising and passing away. Try to grow your wisdom, your mind quality. If the mind becomes stronger and stronger, then the mind understands deeply. Now people try to see the rising and passing away, but understanding doesn’t grow because they want to see. Yogis are not patient; they cannot maintain their practice continuously. They use a lot of effort; they try to see something in a short period; this is a craving idea. No way. In this practice you need a lot of patience and meditate a long time. Then only you can notice your wisdom grow. In this practice, if you understand the nature of meditation, you’ll never stop meditating. If you understand a little bit, you practice a little bit; if you understand more, you practice more; finally, when you really understand, then you’ll really practice. You can start but not stop; there is only one way. Sometimes you see the effect, but you don’t know the cause. Then, we use questions to investigate further. For example a yogi used this question: What is the job description of defilements, of anger? She notices that anger is present and then she used this question to wake up wisdom to see the process, just like this to encourage interest. Sometimes we know the effect but not the cause. When you investigate, interest is present and wisdom is working; meditation also becomes interesting. Once, there were many loudspeakers blaring in the village around the monastery. But the mind is happy. Why is the mind happy? Because it understands that sound is just an object and therefore the mind doesn’t react to the sound. Then another question followed – only this sound? What about other sounds? We cannot say, only this sound is okay, but other sounds, we don’t know. And another question continues – what about other objects? The sound object, the mind understands is nature, but what about other objects/experiences, can the mind understand or not? Just by this thinking and asking, the mind becomes alert, awake and interested to know all the time. The answers are not important. Another yogi was angry; when she watched the anger, immediately it subsided. Then, I asked: Is it enough? Does meditation stop there or not? If you continue by asking, for example, now you notice that when awareness comes, defilement goes off immediately, how much relief from suffering does that give you? Because of this question, you need to watch closer and learn more. If you are not aware, then what happens? The defilement increases, right?. Then you will understand the value of awareness. When you investigate, you can understand more deeply and from more points of view. The ideal is an uncontaminated observing, but the reality is that the observing might be contaminated. And then the practice is to recognize the unwholesome in the way we’re observing. Between the experience that is unwholesome and the unwholesome in the way we observe, it is the unwholesome in the way we observe that is more important to deal with (i.e. is the mind observing the experience to make it go away or to enjoy it?). Always remember to come back to take care of the observing mind by watching it. Even when you observe thought, you want to understand the principle of how the thought is operating rather than the story in the thought. When you understand the principle of thoughts, you take care of two things at the same time: awareness and understanding happens and you also deal with the problem. The idea of self is strong because you don’t understand the cause and effect process. When you understand cause and effect, you will begin to understand that there is nobody there. So, you need to understand more about cause and effect process in everything. That’s why the Buddha said: There is a cause for everything that happens. So you need to practice and investigate about whatever you know: Why, Why, Why? Slowly, you will know that everything is due to cause and effect; and there’s nobody there. Only this understanding will decrease the idea of self. If a yogi watches anger with wrong view, the anger increases. Defilement grows because of wrong view. So, if you’re judging that this experience is me, then defilement follows. Everyone has this strong defilement – that the process is mine: mind is my mind, body is my body. This attitude is very strong; this is wrong idea or wrong view. You cannot practice vipassana meditation with this wrong view. Right view is very important – whatever experience you watch you must think that it’s nature. You must use this second hand knowledge. Slowly when understanding grows you can decide if it is right. We are not judging whether the experience is good or bad; experience is just experience. Any object is the same, object is just object – no object is better than another because the meaning of object is: something known by the mind. No object disturbs you. They are always helping you to be aware. If you have the right understanding, any object is helping you to meditate; e.g. thinking, sound and pain. Both meditators and non-meditators experience similar 6 sense objects [yogi's note: 5 physical: what are seen, heard, smelled, tasted and touched; and 1 mental: happenings in the mind] but the way their mind reacts/their quality of mind is different. Why? It is because they have different views. A non-meditator always judges every experience. Non-meditators think that every experience is either good or bad; always judging and thinking about the concept. When the mind judges that it is good, it likes; when the mind judges that it is bad, the mind resists. The meditator’s mind does not judge the experience because it has the right view that whatever experience that arises is nature. So, any experience/object is nature; it is neither good nor bad. That is why we observe every experience/object and use it to grow our awareness, samadhi and wisdom. Nature is impersonal; nature is neither good nor bad – it simply does its job. Nature means that whatever happens is due to causes and conditions; the process of cause and effect happening is called nature. In nature there is nobody there. If you do not have right view, you cannot practice mindfulness meditation. Awareness alone is not enough – ‘aware, aware, aware, pay attention’ is not enough. You must have right information, then you can think the right way and practice the right way. You can know your feeling. Your feeling will show you. Your quality of mind will show you, whether you have wholesome quality or unwholesome quality. If you practice and something is wrong, the mind suffers. That’s why I ask yogis if you meditate, how do you feel – suffering or pleasant? Many people say unpleasant. If you practice the right way, the mind must be pleasant because of wholesome mind – we try to cultivate wholesome mind, not unwholesome mind. The mind must be pleasant and light – wholesome quality must be growing. But if you practice very tired, suffering a lot, then something is wrong. You can check your indicator; feeling is the indicator, the alarm. So, we need to know about the physical object, mental feeling and mind also. You must know everything. Check your state of mind. The state of mind when you are practicing correctly will be relaxed, light, comfortable, peaceful, awake & alert and interested. Old habits die hard. So, you cannot change immediately. Every time the mind judges (yogi's note: or for that matter when any unwholesome mind arises: anger, worry, fear & anxiety, impatience; craving & attachment or delusion & idea of ‘self’], try to know that the mind is doing so; that’s enough. Slowly wisdom has the chance to think that it’s not necessary. You learn again and again whenever this experience arises. Every time the mind is judging, you try to be aware, to notice that. That’s enough. Naturally and slowly you can change your behavior. ◉ CHANGING THE MIND OR CHANGING THE OBJECT? Yogi: I notice that it’s easier to have awareness outside of the meditation hall. In the hall, I get jhana shock – endless striving for years to try and get jhana. Should I just give up and not go in the hall, or is that avoiding? Sayadaw: First, you want to try to talk yourself into changing the mental attitude about sitting in the hall. If you find that it’s not successful and the mind has a habit pattern – the same set of conditions produces the same set of results – then you shouldn’t let the same set of conditions come together. So, one of the conditions is your attitude. But if that itself does not help, then yes, you should change other conditions like the place or the posture. But we must remember that our objects are always just mind and matter; the object is not the outside – the Dhamma hall or the environment. But we can understand that they affect us because the mind has perception; it has memories of a certain way that the mind goes and it always kicks in that way. So, if we are not skillful at just changing the mind, then yes, we build the mindfulness by being away from where it is not helpful for us. Right thought is helpful; but delusional thought is not helpful. So, that’s why we need to understand thought because thoughts affect use – they make us happy, they make us sad. If we don’t understand, then we are at their mercy. If we had been in a frightening experience and we have memories of that experience, we get scared again, but right now we’re not experiencing that experience, we’re not in that situation, it’s not happening to us anymore, but the mind is believing the thought, it’s almost like the mind has brought us into that situation again; but right now that’s just a thought, an image in the mind. If we see that, then the mind stops being frightened. Imagine we’re sleeping at night and suddenly we think something that causes anxiety and the mind wants to start worrying, then do we want to let that sort of thought continue? To let that thought get a hold on us? If we understand and we have the wisdom, we wouldn’t want that thought to get a hold on us because it’s a harmful thought. One should always understand that thinking is just thinking. Because we don’t understand the reality, we think it’s real, we believe it’s real and then we feel emotions over false premises. Its just images and thoughts and we feel emotions over these things. It’s like watching a movie. The movie is just a movie; it’s not real but we buy into it. A yogi discovers compassion for himself when he sees more of nature rather than the ‘self’ operating and realizes that compassion is built into the awareness-wisdom practice. Now, he can’t be hard on himself as he used to do in the past; and feels relieved in not having to strive so much. Sayadaw: It is the nature of this practice that the longer you practice the more you realize what this practice is about. It takes some time to realize that much and then there is more to realize. All you want to do is to make sure that you get on the path, not in the ditch, and you’re just stepping steadily. No need to run as there is really no hurry. So, take it easy. If you are thinking, it must be thinking about present moment experience, not about other things. If you think more, then your awareness becomes weaker. The aim of thinking in meditation is to support awareness. That is wisdom thinking. For example: What are you doing; what happens then? That’s it. Otherwise the mind is involved in the storyline and becomes agitated. What is wholesome and unwholesome is the quality of the mind. Because wholesome is the quality of the mind, therefore it’s not what we do, right? So, when you pray, it’s not the prayer that is wholesome, it’s the quality of your mind. Check the quality of your mind – do you feel easeful; does it feel good, light, right, wise? For example, people practice metta, they practice sending loving kindness. At that time, they’re supposed to feel loving kindness, that’s what they are supposed to generate. The mechanics is sending metta, but the generation is from a wholesome state of mind. It is only with a wholesome state of mind that you can offer that metta to someone. So, the practice is about generating that state of mind. In Burma people love to do dana, to do charity. They go and donate to monasteries, monks and so on. Dana is the quality of your mind, it is generosity. But so many people do dana in Burma with greed because they’re hoping for a better result for themselves in some future. They have heard the theory that if they are generous, they will get back; that’s what they’re hoping to do with their generosity is to get back something. In Burmese, when you do something wholesome you say you have something wholesome. I ask them if you have something wholesome, show me now, where is it? But it’s just the quality of your mind. If it feels wholesome, you have an immediate result. If you’re truly doing something wholesome, the result in your mind is wholesome and you should feel that wholesome quality. The more we understand about kilesas, the less we suffer because of them. We learn how to handle them – what they are, how they work, when they work. Even if we are not able to completely remove all the conditions that allow kilesas or unwholesome states to arise, what we can become very skillful at is we know them every time they arise; so they never overwhelm us. We understand enough about them so that they never overwhelm us. If we think of the scenario where the kilesas always have the better of us, they always win against our better intentions, then when we become skillful in practice, it’s like we have the better of them and they cannot overwhelm us anymore. They can still be around when the conditions are present, but we see through them and are not that affected anymore.